A Whitman resident maintains an active lifestyle through the Second Street Running Society and marathons. What started as mere training for the 2nd Street 5k to benefit local churches back in 1999 soon became an addiction to running and competing for South Philly native Jacqueline Eells. Now 36, she has competed in more than 42 races and has no plans to stop striding toward success anytime soon. Before embarking on her first 5k at age 17, Eells, who grew up at Second and Greenwich streets, remembers thinking what an accomplishment it would be to have completed such a race. Thus, she would go out and run as far as she could, and then walk a little. Although she had no idea what she was doing, she knew roughly 12 city blocks was the equivalent of a mile, so that’s what methodology she used to determine how far she had run. Seeing as this race was right in the heart of her neighborhood, and the course ran right by her house and supported her church, she knew she wanted to continue running it in the years to come. Ultimately, she went on to secure first-place nishes in her age group three consecutive years. Around the same time, Eells began her college career at Widener University where she decided to run track, participating in the 5,000 meter run. Yet, as life changed and she graduated college advancing into the working world, her running style also transformed. From what started as a sole focus on competition and increasing her speed and nish times slowly progressed from being about speed to focusing on distance and stamina. 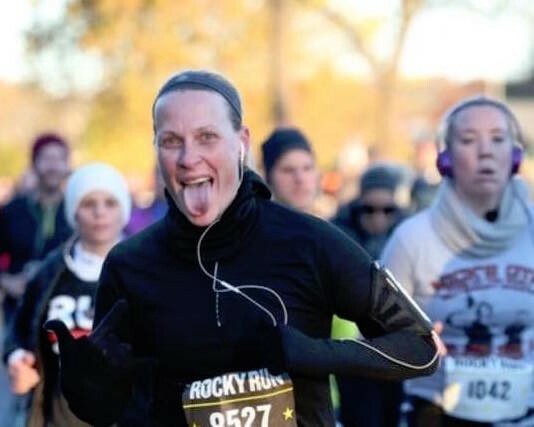 To help keep up with her passion for running, Eells helped form the Second Street Running Society in 2016, and credits the at first word-of-mouth organized group as what has largely made her into a better runner. What started as just a group of runners, soon transformed into an amazing bunch of friends who constantly encourage and motivate each other to do their best, without ever leaving anyone behind. Although running is initially what brought this group, which Eells now considers her “running family,” together, she explains the friendship that has since grown keeps them going. Grateful every day to have met a great group of people through her sport, she noted they are not just there for each other during runs, but after as well, scheduling happy hours, brunches and dinners a few times a month to simply enjoy each other’s company. However, from a running-perspective, the commitment each member of the Second Street Running Society exhibits undoubtedly contributes to their individual successes in performing. Engaging in what they refer to as the “5 at 5 a.m.,” the runners have no problem with waking up early and taking to the streets. While she explains that she has so much fun causally running with this group, it is still the thought of race day and the excite- ment that it brings that is what makes all of the miles worth it. She encourages everyone to experience a race at least once in their lives, as she believes there is nothing like it. Although she is the first to share her excitement for these races, Eells admits often people will tell her she’s crazy for running as much as she does, or ask her why she would ever have the desire to do so as it doesn’t sound fun at all, for Eells it provides a release. For her, this is just time to focus on her thoughts and burn some stress, in addition to helping her shape as this has always been the easiest workout for her. While some people don’t understand this passion, Eells added her family has always been there to support her. For example, her parents, Jacqueline and Ronald Eells, and her husband, Marc Holmes, always ask how she does, tracking her throughout her races to see her splits and nish times. Additionally, her husband will come to the nish line with their sons at times to show support, and her son, Mason, always wants to be a part of races with her or wants her to teach him how to run. Setting an unbelievably strong fitness example for her sons, since downloading and beginning to readily use the Nike running application on her phone roughly four years ago, Eells has been able to track 274 runs and more than 1,455 miles. One of the more recent, larger-scale races Eells entered took place over two days in November 2016. It started with the Rocky Challenge, which consisted of 13.1 miles on a Saturday followed by a 26.2-mile marathon a day later. She is training for two fall marathons — the Baltimore Marathon in October, and the 39.3-mile Rocky Challenge in November.